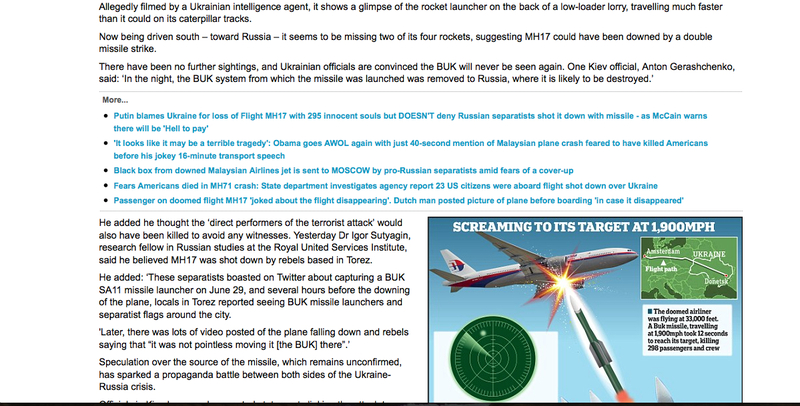 This article sorts through the initial waves of disinformation in the days immediately following the downing of MH 17. 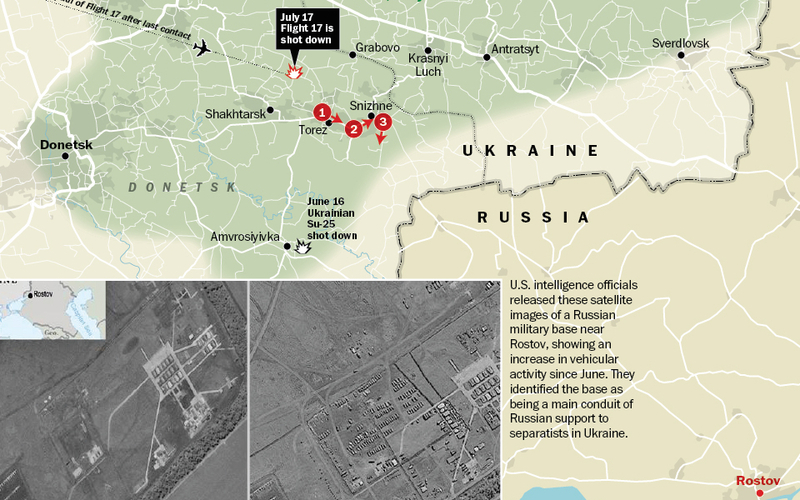 The ‘BUK’ surface-to-air missile shoot-down scenario is closely scrutinized and ultimately discarded as a propaganda ruse; by the end of July, 2014, inside of two weeks of MH 17’s demise, media should have foreclosed on the surface-to-air missile story and directed their efforts to investigating a Ukrainian fighter jet, instead of parroting what clearly are official and egregious lies. 1 chiefly derogatory information, esp. of a biased or misleading nature, used to promote or publicize a particular political cause or point of view. 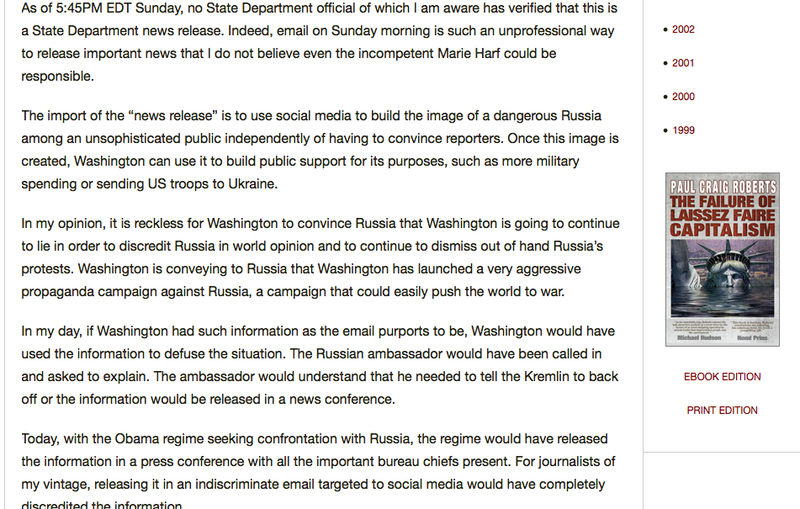 • the dissemination of propaganda as a political strategy. A Noise Attenuator is a device necessary for a military radar to set aside ‘clutter’ and guide a missile to its target. The only noise attenuator that can be applied to propaganda is human counter-intelligence measures. It’s early to determine what is actually going on with the ‘shoot-down’ of Malaysia’s Flight MH17 but there is ton’s of propaganda ‘clutter’ or ‘noise’ that can be attenuated, so let’s have a go. Does a Buk launcher have a rudimentary, stands alone radar integrated? 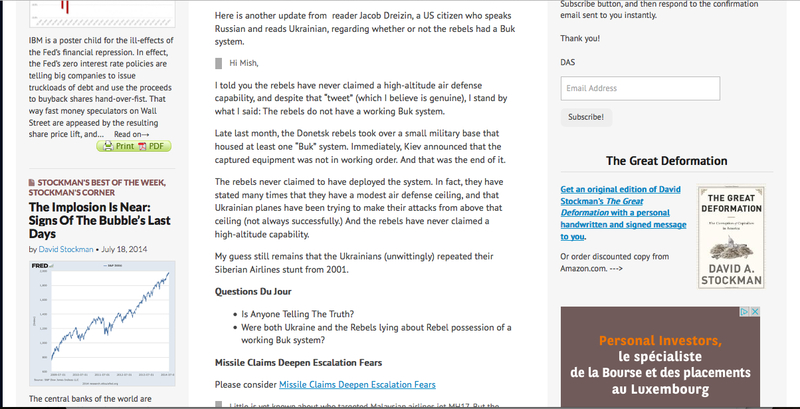 Yes, presuming there were a functioning system in the hands of the ‘rebels’ which it would seem there was not. Any professional technicians allegedly provided by Russia would absolutely understand a stands alone launcher would be too dangerous to use for target engagement because it would be firing ‘blind’ .. because this rudimentary detection component would be a ‘range only radar’ that can tell you practically nothing about a target other than distance. And most certainly they would inform any ‘rebels’ asking for technical assistance the launcher could not be used in this state. 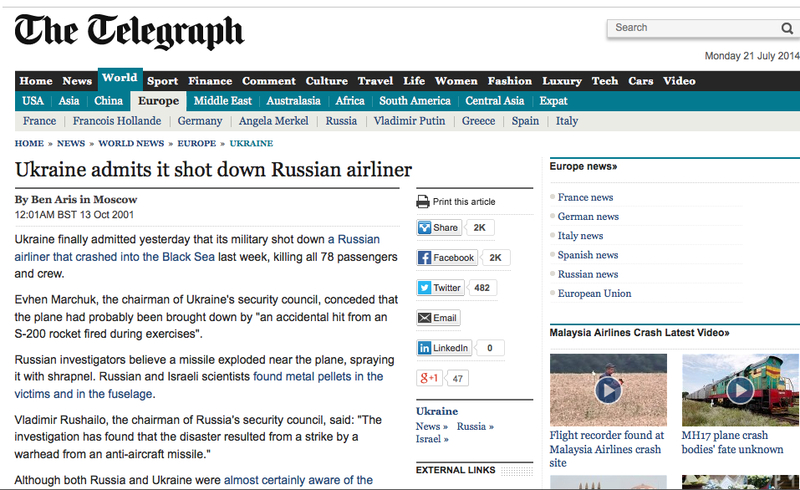 Would Russian technicians endanger Russian (and other) civilian flights, OSCE flights, treaty over-flights, et cetera..? Excuse me, but the parody of Russian mentality engendered in western propaganda does not apply in reality, because unlike the neo-nazi forces controlling Kiev, these are not stupid people. 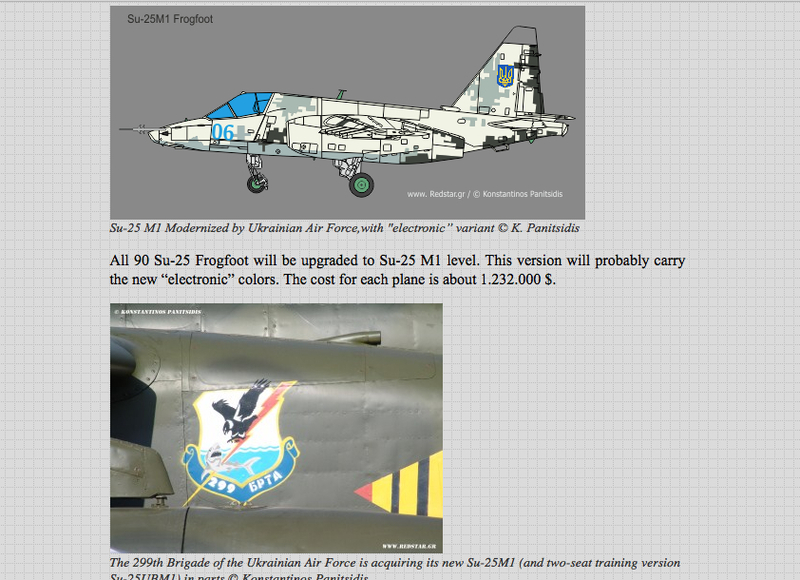 Additionally, one would have expected any operational SA 11 system in rebel hands would have been previously exposed, if it were so much as to have employed its radar to lock onto (‘paint’) aircraft, because Ukrainian (or ‘other’, such as USA ) surveillance or military aircraft in the area would have detected this with built in electronic counter-measures. On top of this, anyone qualified to operate the SA 11 would realize Flight MH 17 was not a Ukrainian military flight for the simple fact of altitude. At 10,000 meters height, it would be clearly obvious this plane could only be continuing on to Russian airspace, any military cargo flight intended to resupply Ukrainian forces in the close proximity Ukraine/Russia border region would have been maneuvering for landing, already at much lower altitude. 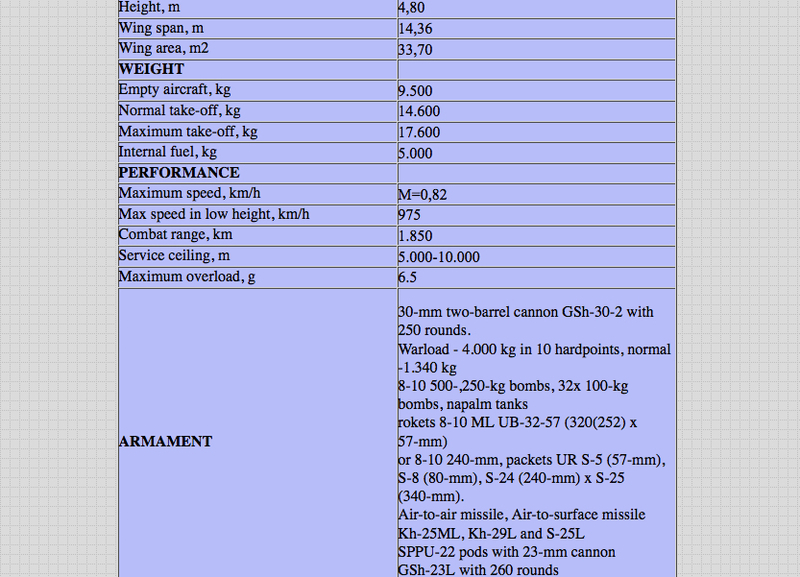 Having trained on a similar system (Improved Hawk) to the Buk or SA 11, I tend to agree with the experts doubting the rebels have this capability. This now bears on what information might be in the black boxes, where the preceding two hours conversation between the pilots, and between the pilots and Kiev, would be recorded. Whoever has the black boxes, has the information seized from the flight controllers, and additionally, the pilots internal (cockpit) conversations. 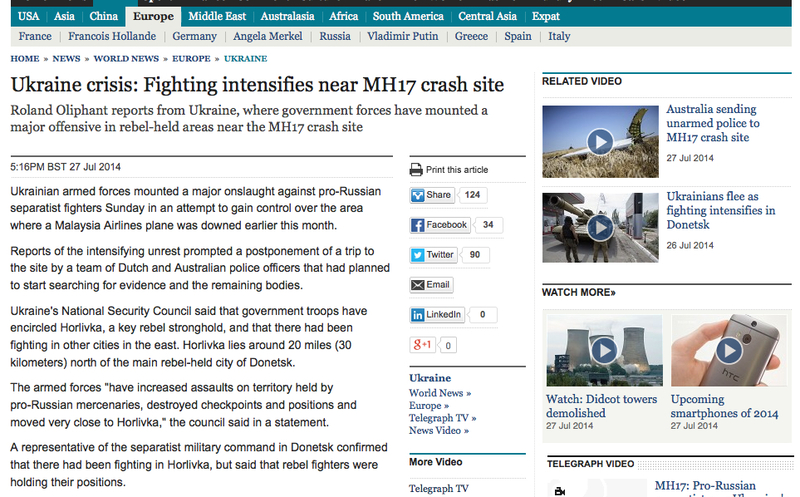 What might have been a rationale for diverting Flight MH 17 into overflight of a combat zone by the controllers in Kiev? What did the pilots express between themselves, concerning this? Not only has there been a longstanding de facto ‘unconditional surrender’ demand by the western democracies to the rebels, with their support of Kiev, now the OSCE has already tried and condemned Russia as the guilty party for allegedly arming the rebels, enabling the shoot-down of MH 17. The only question is, who COULD be trusted to safely deliver and analyze the information in a manner satisfactory to all parties? Likely answer? No one. Because at the end of the day, someone has to take responsibility and that someone will do anything in their power to prevent the truth coming out. 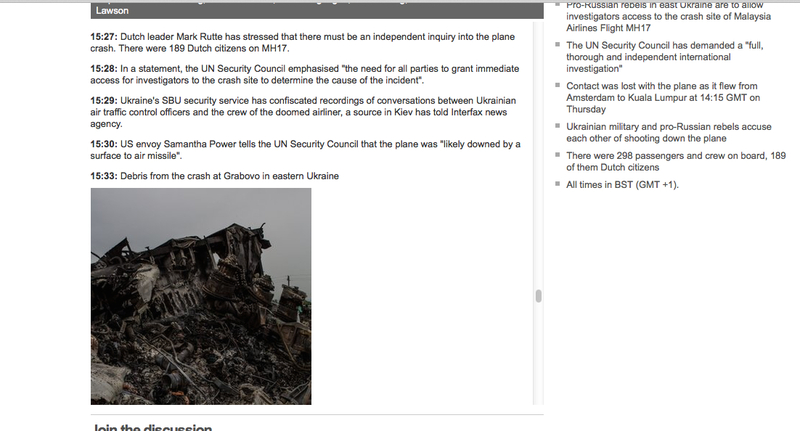 If it is (and likely is) Kiev’s forces shot down Flight MH 17, the western democracies (and the USA particularly) will bend over backwards to prevent the unthinkable; having never pressed the Ukrainian government for a honest ceasefire, the possibility looms they will be held accountable for the crimes of Kiev. Deception of the enemies’ public is one of the objects of war. When corrupt rulers treat their own public as the enemy, the state will not, cannot endure. What can become of any creature that devours itself? History does not forecast a kind reckoning for the rulers in Kiev. Or for the western democracies backing a regime devoted to killing its own people in Ukraine. Considering the USA & allies have depended largely on social media for ‘evidence’ to now, a relevant list of western democracies social media manipulation programs run by corporations, intelligence agencies & military can be found at this link. RT Live has rebroadcast a BBC correspondent’s interview of on the ground witnesses, indicating there was indeed a military jet in the immediate proximity of Flight MH 17. These on the ground witnesses had reported seeing a jet making a sharp turn maneuver and departing, when immediately looking up at the sound of explosions. This would seem to confirm the Kremlin reports of military radar tracking what is presumed to be a Ukrainian Sukoi 25 in attack range of the Malaysian flight downed by missile(s). The BBC had fairly quickly deleted this report filed by its employee on location (third party transcript here.) It is this last fact indicates to this reporter (myself) a suppression of evidence on behalf of the authorities in Kiev; as I’d a previous encounter with BBC suppressing facts embarrassing to the western democracies. Tangentially related, an Interpol arrest warrant has been issued for USA coup ally Dmitriy Yarosh. Yarosh had been instrumental in uniting extremist elements & the Maidan protesters turning violent, resulting in the (USA applauded) overthrow of Victor Yanukovych. It took nearly five months for the Russian request to be acted on but at the end of the day, substantive evidence must have required action by Interpol; pointing to the sort of bedfellows the U.S. Department of State (nee CIA) has engaged in Ukraine. 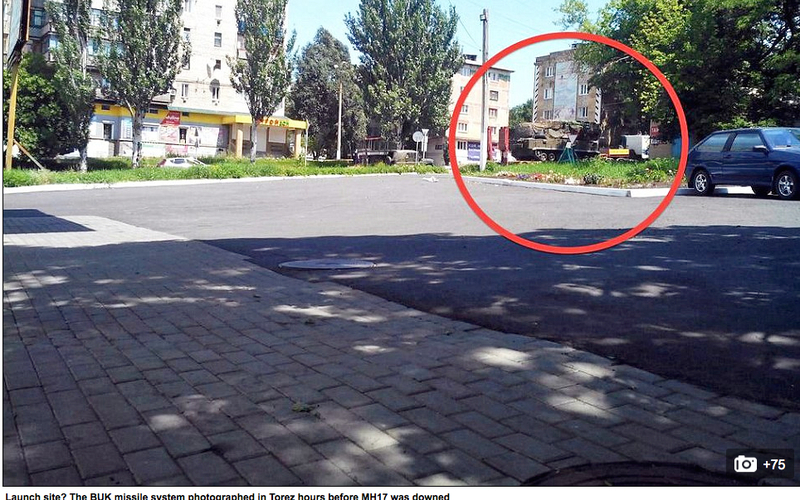 Very noteworthy is, the USA still has not met the Russian invitation to match Russia by producing the satellite images of a Ukrainian army unit in possession of a SA 11 ‘Buk’ missile launcher in the vicinity of the Flight MH 17 at the time of the shoot-down. Russia has produced these images. Why won’t the USA? 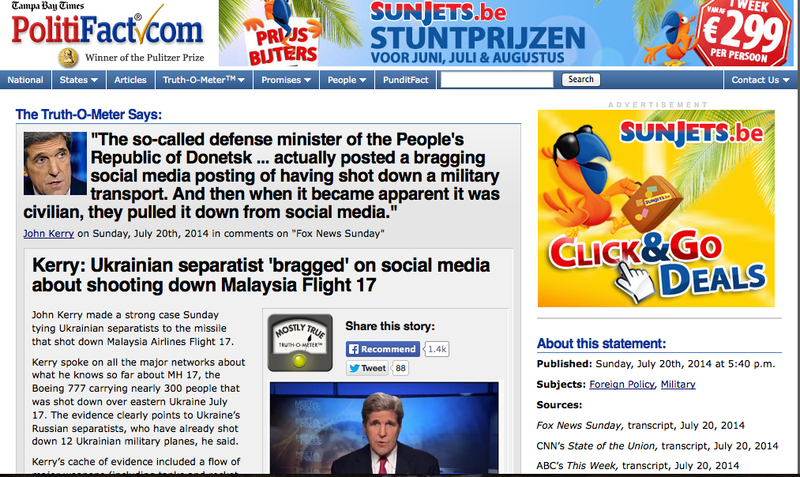 At the end of the day, it seems perfectly plausible the entire ‘Buk’ episode consists of Kiev forces parading a SA 11 system, subsequently attributed to an alleged shoot-down of the Malaysian plane by ethnic Russian ‘rebels’ in Ukraine, as a cover story; on account of Flight MH 17 had in fact been shot down by a Ukrainian forces Sukoi 25 combat jet. 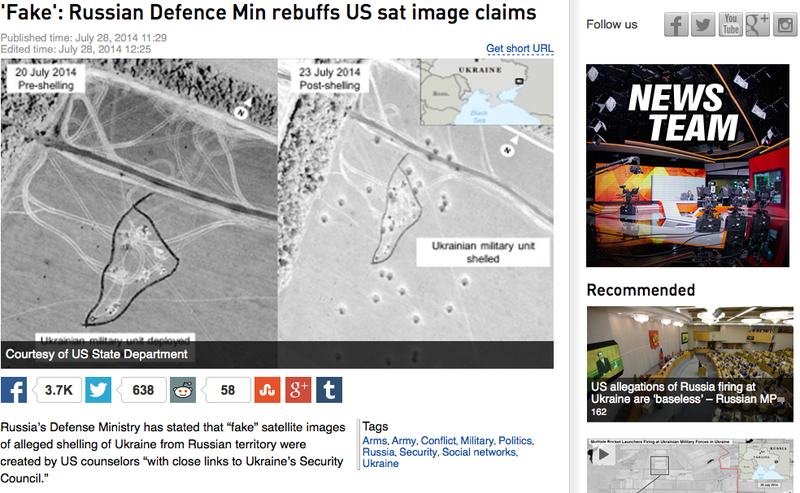 Of course none of this proves anything, but only goes to show holes can be poked in the Kiev claims endorsed by Obama. So, will the USA (directly, not via stooges in Kiev) provide high quality, properly dated satellite images backing up the official line? They probably can’t. A closing thought would be, had Obama not written into history his proven track record as a liar, we would not need be as disturbed at his claims concerning Ukraine as we are at the actual shooting down of MH17. 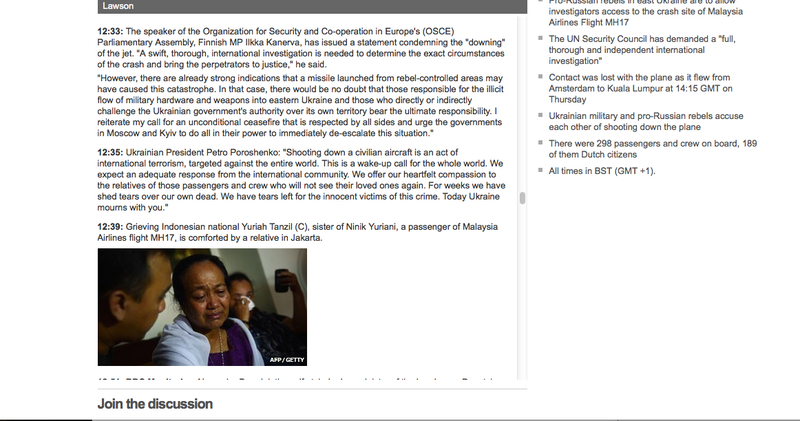 6 December note: several families are demanding (via a lawyer) the MH 17 investigation be surrendered by the Dutch and turned over to the UN. 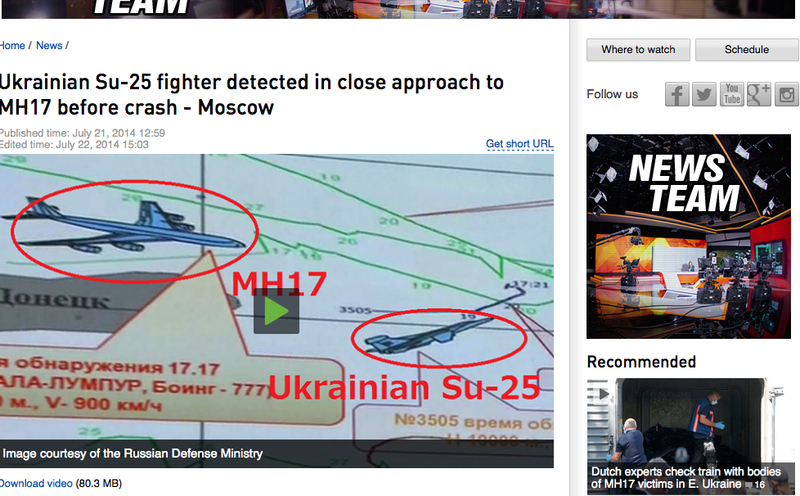 There is a preponderance of the evidence MH17 had been brought down by a Ukrainian SU-25 combat jet as attested to by the Russians, who handed the relevant radar data to the Dutch-led investigation. This evidence had been at first stonewalled and finally ignored. Meanwhile (quite sometime later) the Western led investigation produced fragments of a (Soviet era) Russian manufactured Buk surface to air missile. 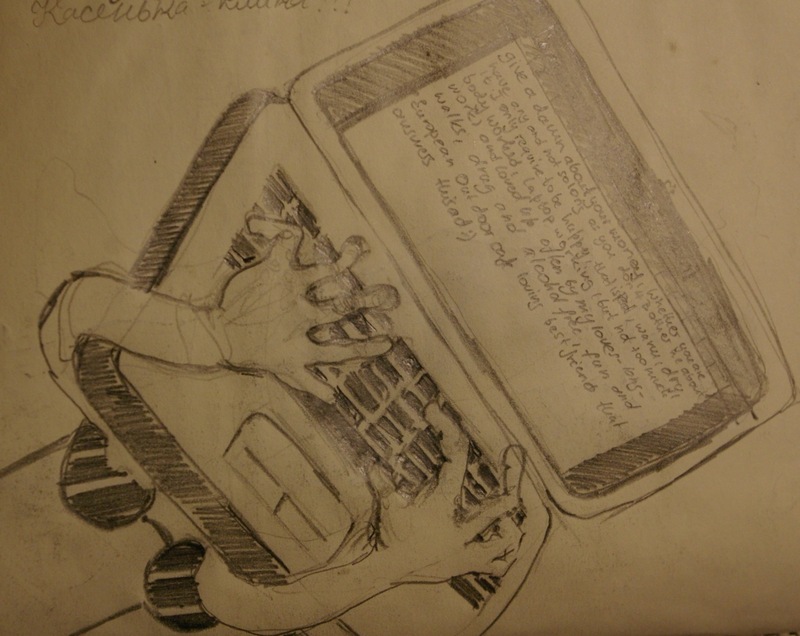 The Russians declassified the Soviet era documents showing that particular missile (custody established by serial number) had been delivered to and should have been in the possession of (post-Soviet inheritance) Ukraine. Superb article, Romald. Sharing to G PLus. Very astute and thorough article with plenty of evidence supporting the claim. 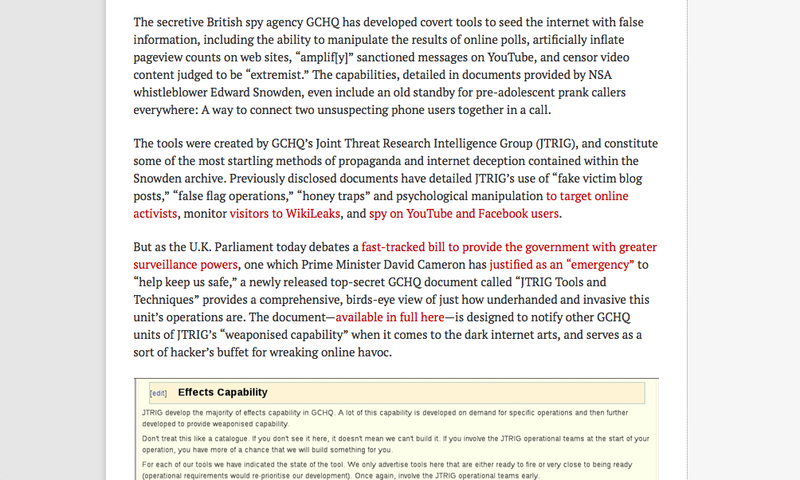 One programming note though the link to The Intercept for Glenn Greenwald (trust Glenn Greenwald at The Intercept) leads to an XML page instead of the actual website.